Hand Stamped Batik Accents on White Cotton Shirt For Men, "Blue Waves"
Bali's Agus Suryanto designs a shirt for men ideal for casual elegance. 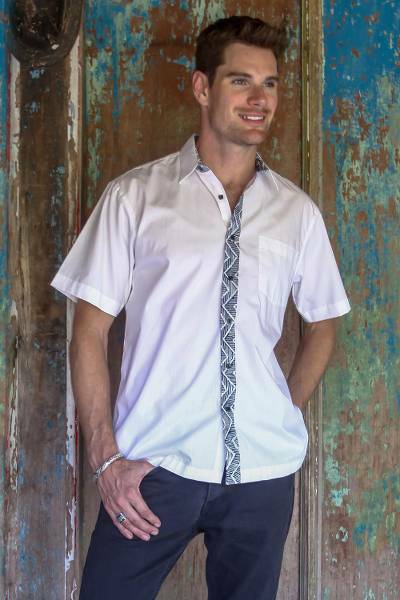 In cool hand-woven cotton from Lombok Island, the white short-sleeved shirt is adorned with wavy patterns achieved through hand-stamped batik on the button placket in blue and white. The shirt features a chest pocket and fastens with six buttons. You can find men's cotton batik shirt 'Blue Waves' by Agus Suryanto in clothing categories such as Batik Shirts and Cotton Shirts. Enjoy exploring these sections for other Novica treasures.